The epidemic of thyroid disorders is something that has really caught my eye over the last few years. As my team and I encounter more and more patients that have been diagnosed with these conditions, I feel compelled to get more helpful information about this out to the public. Something that blew me away was that, according to the American Thyroid Association, at least 12% and up to 30% of Americans will experience a thyroid disorder at some point in their lifetime. Even more of an eye-opener was that possibly up to 60% of those cases will go undetected (1). I personally encounter hundreds of individuals with hypothyroidism every year, and I’ve seen the debilitating effects that can occur due to a thyroid dysfunction. My goal is to provide detailed information to help you follow a hypothyroidism nutrition plan. Hypothyroidism is a specific type of thyroid condition that is generally characterized by an under-active thyroid gland or the inability to convert inactive thyroid hormone to active thyroid hormone that is used by the cells of the body. The thyroid is a butterfly shaped gland that sits just above the point where your clavicles meet (in your lower neck) and is one of the primary organs responsible for regulating your metabolism. 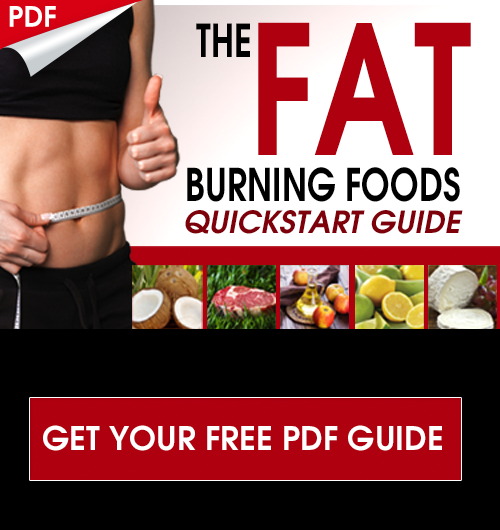 Most of us think of our metabolism simply as how much fat we’re able to burn but actually it can influence the function of every cell in our body and how those cells utilize the body’s resources. So with this in mind, it’s easy to see how a sluggish thyroid can dramatically hinder the overall function of the body. Similar to many hormone-producing glands in the body, the thyroid is regulated by a biological signaling chain made up of the hypothalamus, the pituitary gland, and of course the thyroid gland. The mechanisms by which this axis operates can go into quite some detail but for the purpose of this article it is important to know that they work in what’s called a feedback loop. This loop is called the hypothalamus- pituitary – thyroid axis or the HPT axis. 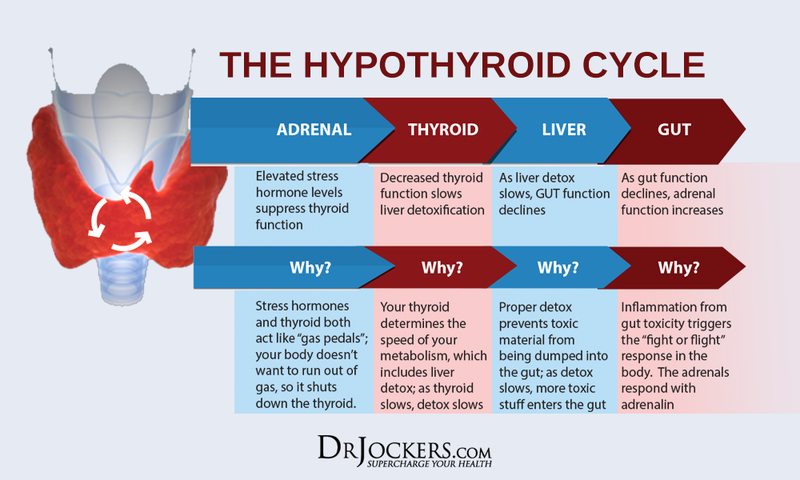 What this means is that the hypothalamus and pituitary glands are constantly monitoring the body’s thyroid hormone levels (T3 & T4) and sending signals to the thyroid to either produce more or less depending on current conditions. 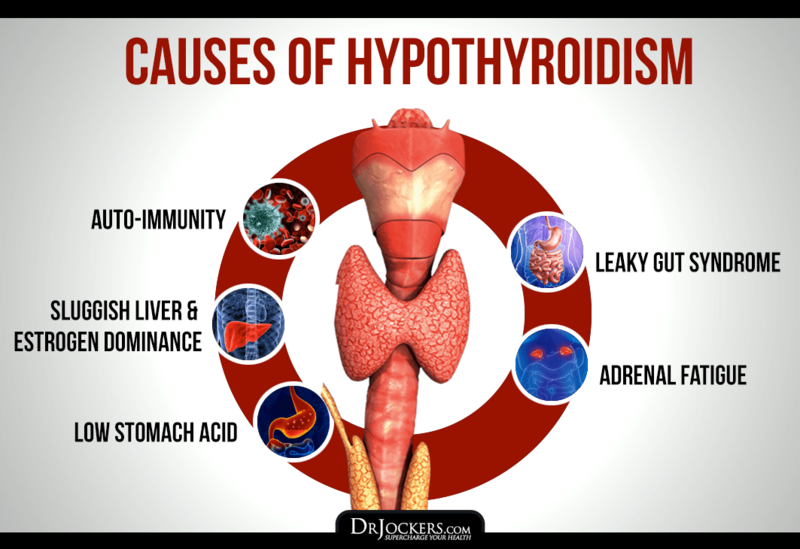 When this axis becomes faulty, thyroid hormone levels can become either too high or too low, referred to as hyper- or hypothyroidism respectively. As a functional medicine expert, I’ve learned that disease symptoms that we encounter can be seemingly far removed from the root cause. In my experience, hypothyroidism can usually be tied back to deeper dysfunctions in the body. In other words, an underactive thyroid is not the problem, but is actually a symptom that has occurred due to a problem that is more deeply rooted which has likely gone undetected for some time. When I am working with someone who has thyroid issues, I typically investigate 5 primary causes first. Hashimoto’s Thyroiditis is the most prominent form of hypothyroidism diagnosed in the US (2). This thyroid condition occurs as the result of the immune system creating antibodies that target the cells in the thyroid gland that continually inflame and damage it. Over time this leads to suboptimal thyroid function and all the consequences that follow. This response is not unlike when our body tries to fight off a cold or flu, however when our body attacks its own healthy tissues the immune system has become overactive and this is the defining characteristic of auto-immunity. It is absolutely critical for any physician who is treating someone with a thyroid disorder to test for thyroid antibodies. Unfortunately, few mainstream medical doctors test for thyroid anti-bodies and so most do not ever get the proper diagnosis. Here is a helpful article on healing autoimmunity naturally. We often don’t give our liver enough credit for its many roles in the body. In terms of thyroid health, the liver is actually partly responsible for the conversion of thyroid hormone T4 into its more active form, T3. If the liver has been compromised, then proper conversion will not take place and low T3 levels will likely be the result. One of the more prominent hindrances to liver function that I see is estrogen dominance. This usually occurs as a result of exposure to environmental estrogens that aren’t detoxified properly. In addition, estrogen dominance can occur simply due to inadequate detoxification of the body’s own endogenous estrogens. So avoiding these toxins AND supporting the liver are both keys! Here is a helpful article on strategies to improve liver detoxification. Furthermore, HCL acts as a primary immune barrier to pathogens getting into the lower GI tract. When HCL is low, pathogens can pass through, colonize in the small intestines, and throw off normal bacteria balance (dysbiosis). Dysbiosis is a commonly tied factor to thyroid conditions, especially those with auto-immune like characteristics (6). This article here goes over how to correct low stomach acid levels naturally. Leaky gut is when the gap junctions between the cells in our intestinal wall become too wide and end up letting large, undigested food molecules through. The immune system tags these molecules as foreign invaders and creates antibodies to “fight them off”. This immune response contributes to chronic inflammation and autoimmunity. Contributors to leaky gut include food sensitivities, dysbiosis and exposure to toxins. In addition, those with leaky gut likely also have damaged villi. Villi are tiny hair-like structures on our intestinal lining that capture nutrients and absorb them into the blood stream. When they become damaged, they also lose this ability and contribute to malnutrition. Chronic stress, if not managed properly, has the potential to disrupt almost every process in the body. This is very much the case with thyroid hormone conversion. There is evidence suggesting that cortisol (our stress hormone) may inhibit 5’-deiodinase which plays a primary role in converting thyroid hormone T4 to active T3. Not only does adrenal stress interfere with T4-T3 conversion, but it has also been shown to generally interfere with the hypothalamic-pituitary axis which is the regulatory pathway that monitors the thyroid. Amidst the many stressors of our thyroid function, nutrition may be one of the most powerful tools to aid in the healing process. We truly believe that food and food based products can be used as medicine for our bodies health challenges. In general, we want to follow a nutrition plan that is low in carbohydrates, high in healthy fats, fiber, plant and herb based phytonutrients and clean protein sources. These are the best foods to focus on including and building your daily diet around. This is the foundation of a hypothyroidism nutrition plan. Sea vegetables are a super-rich source of minerals and iodine. Iodine deficiency is a well-studied causal factor in hypothyroidism and is absolutely necessary for the production of thyroid hormone (8). The best forms of seaweed for dietary iodine are kelp, kombu, nori, and wakame. These are typically purchased in whole, dry form or are sometimes sold as seasoning blends that help disguise the seaweed taste if you prefer. 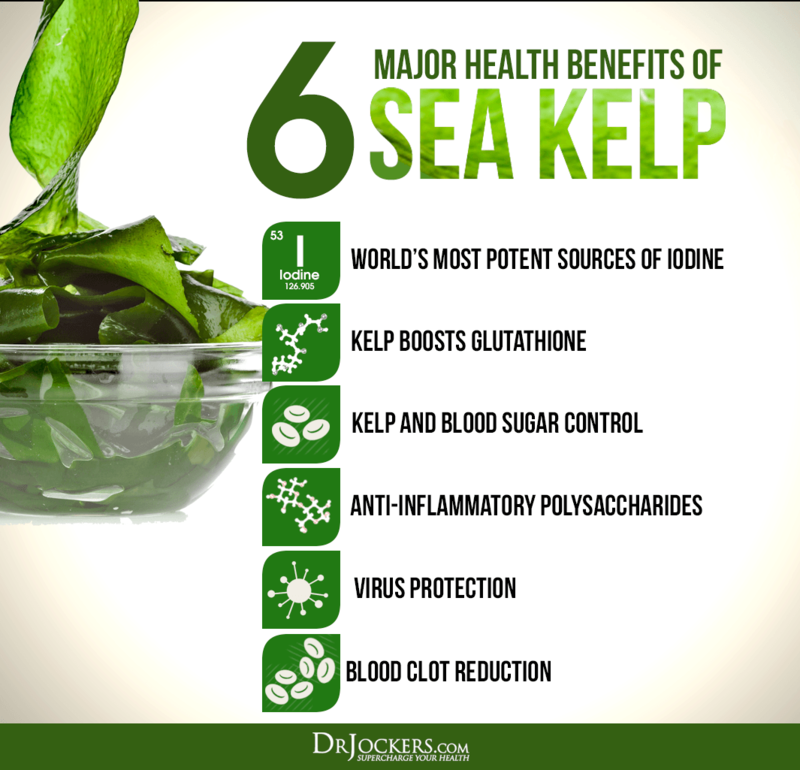 Kelp is the highest in iodine, but all the sea vegetable types are rich sources of trace minerals including iodine, magnesium, selenium and more. They are also a fantastic source of chlorophyll for overall bodily detoxification. I love snacking on Sea Snax and using either the Bragg’s sea kelp delight or the Herbamare herb seasonings on my food to get the benefits of sea vegetables in my diet. This is a key food to use on the hypothyroidism nutrition plan. Adding coconut to your diet in the form of full-fat coconut milk, coconut butter, coconut oil and coconut flakes is a very important part of this hypothyroidism nutrition plan. The healthy fats in coconut help boost immunity, control inflammation, nourish the gut and even help stabilize blood sugar. All of these benefits combined, help to lower internal stress on the body and allow it to heal properly. In addition, replacing unsaturated vegetable oils with healthy fats like coconut is ideal because unhealthy fats contribute to inflammation and weaken the thyroid. On our website, we use coconut fats in the vast majority of our recipes. You can also use XCT oil, which is made from coconut for a faster stimulation of ketones. The other benefit of XCT oil is that it does not taste like coconut. There seems to be a common tie between gut function and thyroid function. Those with inhibited digestion especially will find bone broth to be beneficial as it provides collagen protein and a rich arsenal of nutrients like minerals and the amino acids proline and glycine that are easily absorbed and healing to the gut lining. The branching benefits of this include a boost to the immune system and aiding in the removal of food sensitivities. This process will further help reduce inflammation and allow the body to heal more effectively. This is a powerful food on the hypothyroidism nutrition plan. Butter from grass-fed cows is a densely packaged source of nutrition. It contains fat-soluble vitamins A, D, and K2 along with healthy omega 3 fatty acids. On top of that, butter is a great source of butyrate which is a short-chain fatty acid that has anti-inflammatory properties. The benefit doesn’t stop there as grass-fed butter is also a healthy source of selenium, magnesium, zinc and iodine; all of which play a role in thyroid health. If you have a food sensitivity to dairy then ghee may be a suitable alternative. Tying back to the gut connection with thyroid, fermented foods are a powerful nutritional strategy. Consuming probiotic foods like fermented veggies, fermented ginger, pickles, sauerkraut, kimchi and beverages like coconut water kefir will help promote the flourishing of a healthy bacterial environment in the gut. This may help further by controlling inflammation, leaky gut and the associated auto-immune reactions. It is a good idea to combine a small amount of fermented veggies with each meat based meal in order to help with the overall digestion process. You can make this as simple as adding a few spoonfulls of saurkraut or an organic pickle or 2 with your meal. Avocados are an incredible source of nutrition including healthy fats, antioxidants, and more (9). 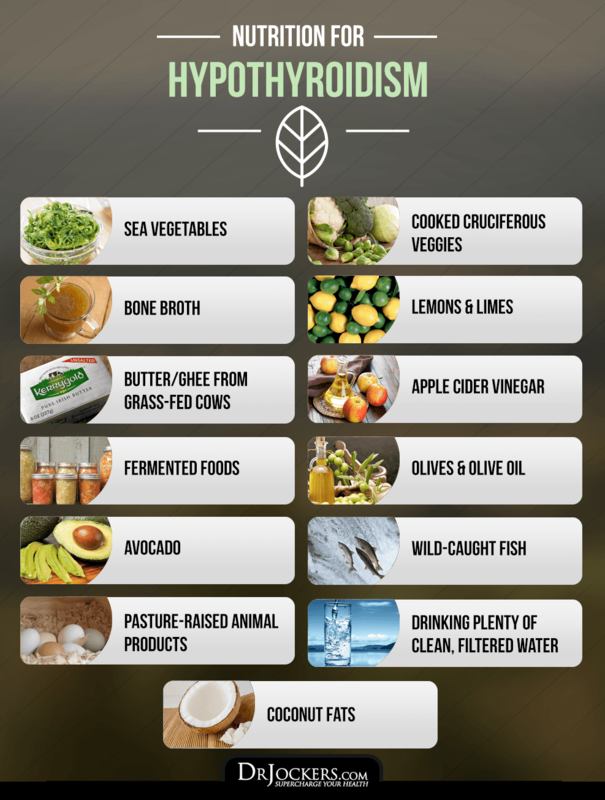 When combined with other nutrient rich foods, the fats help you extract more nutrition form your meal. Additionally, avocados boost the health of your digestive tract as an excellent source of dietary fiber. Lemons and limes are a low-sugar fruit packed with vitamin C and citrus bioflavonoids. Vitamin C and bioflavonoids are valuable nutrients in a hypothyroidism nutrition plan because they help protect the thyroid from free radical damage. Additionally, it has been shown that in order for the thyroid gland to draw in iodine there is a biological pathway (called a symporter) that requires both Vitamin C and Vitamin B2 in order to function properly. So in addition to maintaining healthy B2 and Iodine levels, taking in adequate vitamin C on regular basis helps support the production of thyroid hormone T4. A great way to get lemon or lime into your body is drinking a glass of water with 1/2 lemon squeezed into it each day or squeeze fresh lemon on your meat and vegetables for dinner. Using apple cider vinegar (ACV) on a daily basis can help balance blood sugar, support alkalinity in the body, and support a healthy gut. All of these will benefit hypothyroidism by lowering inflammation and naturally reducing autoimmune reactions as a result. ACV can be taken before meals, mixed in with salad dressings, or simply sprinkled over foods in 1 TBSP doses. Be sure to find one that is raw, unpasteurized and contains the “mother” which is the fermenting ash of the apple. This would indicate that the vinegar is still alive and therefore it will support your health more effectively. Also, be sure to avoid buying this in a plastic bottle and opt for glass bottles to avoid environmental toxins. I like Bragg’s ACV, which is the best on the market. Because one of the foundational principles of a hypothyroidism nutrition plan is inflammation control, olives and olive oil will play an important role providing a conveniently packaged combination of antioxidant compounds as well as healthy fats. 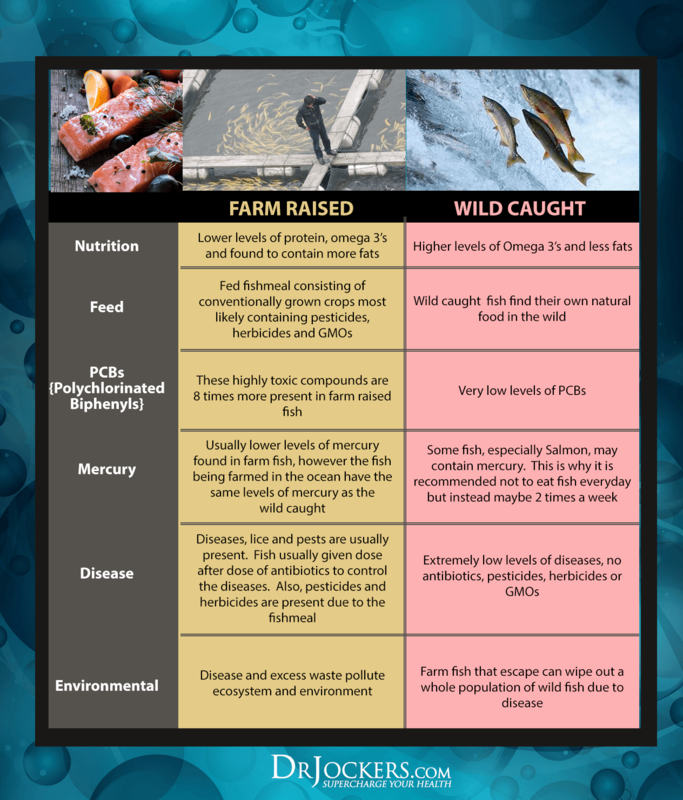 Wild-caught fish like Alaskan salmon and sardines can supplement a hypothyroidism nutrition plan by adding valuable omega 3 fatty acids along with powerful antioxidants like astaxanthin in salmon and selenium in sardines. This combination of nutrients helps to support a healthy hormone balance, control inflammation, and heal damage in the gut. Selenium is also one of the most critical nutrients for conversion of T4 into T3 and can even help to downregulate thyroid antibodies in those with autoimmune related thyroid disorders (11). If you haven’t made the transition from conventional animal products to those that are produced organically in pastures, then this is a key step to make on your healing journey. Conventional animal products are high in inflammatory omega-6 fatty acids and significantly lower in nutrients as a result of their poor diet and living conditions. Cruciferous vegetables like broccoli, cauliflower, and brussel sprouts are super-dense nutrition sources that help support anti-oxidant and detoxification systems in the body. I emphasize that these foods should be cooked to release any goitrogens. This is an important part of the hypothyroidism nutrition plan. These are compounds that interfere with thyroid hormone production by blocking iodine uptake into the thyroid gland. In cases of hypothyroidism, I recommend steaming these vegetables thoroughly before consuming to remove most goitrogens. In general, this is a great strategy for everyone as cruciferous veggies in their raw state can be very can be very challenging on the digestive system. I would recommend adding in cruciferous sprouts such as broccoli or kale sprouts in their raw form. These are very low in goitrogens and contain tons of enzymes and bio-active anti-oxidants to support healthy thyroid hormone function. 2 http://www.thyroid.org/hashimotos-thyroiditis/ hypothyroidism nutrition plan. Excellent article. Thank you for so much actionable information. I truly appreciate your website. Best article I read on the Thyroid. On other websites it was said don’t eat cruciferous vegtables which I love but your site stated eat them cooked to get rid of the goitrogens. Thank you for all the advise. Thank you Maryann! Yes, steamed cruciferous veggies are a great part of a hypothyroid nutrition plan. But avoid eating them raw because they have active goitrogens and even more importantly they can be challenging on the digestive system…which is typically compromised in individuals with thyroid problems. Great! I wish you luck on your journey Shannon! How can I save this article? It won’t allow me to pin it. Also what are your thoughts on using hemp products? Hey Sara you could try bookmarking the article in your web browser! Also, hemp can be okay for many people. The seeds can be hard to digest for some but otherwise can be a good source of healthy fats and protein. Very good article! Thank you Dr. Jockers! Dr.Jockers, do you think that thyroid issue if left side where the thyroid supposed to be, all the time swollen there,feels like hard bag there. And when I swallow the food, it’s moves up & down too. Thanks! Can you take Thyroid Strong if you are on Armour Thyroid? Thanks! Hey Meghan great question! You can definitely take both BUT you will want to work with a doctor to monitor how your Thyroid is responding so that you can adjust your dosages accordingly. Hey Tonya, I help people adopt lifestyles that help their bodies overcome these issues! Feel free to email michael@drjockers.com with any more questions you may have! Thank you dr Jockers your articles are always straight to the point. Dealing with thyroid issues is definitely not an easy journey with all the information out there. You are definitely making a difference. 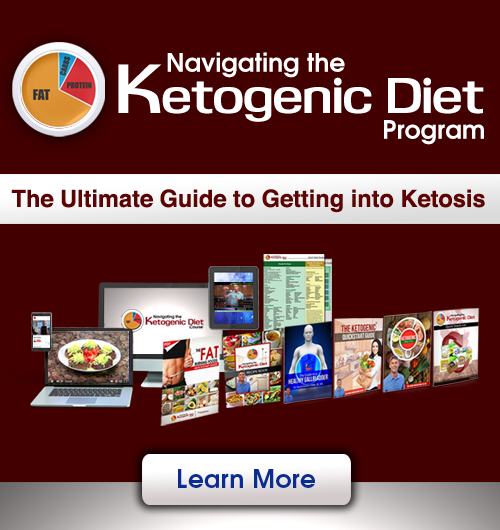 Does this diet help with overactive thyroid as well? I haven’t no treatment yet but the doctors want to give me RAI and I perfer medication and a healthy lifestyle. Do I have to just accept one option? I was taking one cap of Thyro-Gold bovine thyroid 150mg. then I found your Thyroid Strong. My Functional Medicine Nurse Practitioner is fine with both. I was taking one cap. of each on alternating days, then I discovered with muscle testing that I needed 300 mg. of the thyroid glandular so I started taking one cap. Thyro-Gold and one cap. Thyroid Strong together daily. Does that sound like an OK protocol? Yes you can do that. Shouldn’t be an issue. The nice thing about the Thyroid strong is that it also has the iodine and selenium your thyroid needs.